Fleuretta Fée addressed an impressive amount of ideas in this season's collection, and they mostly manifested as textures. The extreme play between transparency and opacity made for some intriguing, if not entirely wearble, looks. 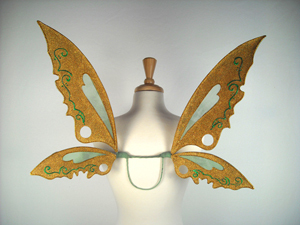 © 2001 - 2014 fairy-wings.com and On Gossamer Wings. None of the content of this site may be reproduced without written permission from the artist.